The story of the United States company, Caterpillar, began in 1890 when Benjamin Holt and Daniel Best started experimenting on various kinds of tractors for agricultural use. After about 14 years their research resulted in the company's first steam engine tractor and two years later the first tractor with an internal combustion engine. During the First World War tractors by Holt and Best were widely used by the military forces. From this moment on the company grew at a dizzy rate, from the production of farm machinery it expanded to include that of land vehicles for professional use and included special engines tailor-made for type M4 armoured tanks used in the Second World War by United States troops. n 1925 Caterpillar was founded, following fusion of the energies of the two families, Holt and Best. The post-war period represented a very important phase for the company, during which its first European base, the Caterpillar Tractor Co. Ltd, was set up in Great Britain, the first of a long series. In 1963 the United States company signed a joint venture with the Japanese Mitsubishi Heavy Industries Ltd. In over 70 years of history Caterpillar has managed to develop engines designed specifically for various applications, achieving considerable international success and widening its commercial horizons. From 1985 to date, the Caterpillar range of products has been widely diversified to meet the needs of a great variety of clients, with over 300 products in its catalogue. Caterpillar has recently acquired the English Perkins Engines and has continued to expand, also acquiring the German MaK Motoren, thus becoming one of the most impressive industrial giants on the international engine panorama. 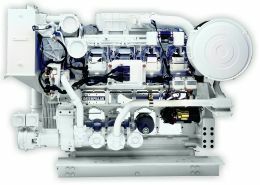 Working on different fronts, Caterpillar has over time developed engines for the nautical world, making its mark with reliable products, effective in terms of performance, weight and size. Caterpillar currently makes over 100,000 engines, used all over the world in the widest range of applications, with power ranging from 10 HP to 6,598 HP. Nautical products range from 350 to 3,000 HP and currently represent the world's best selling range of marine engines over 250 HP. 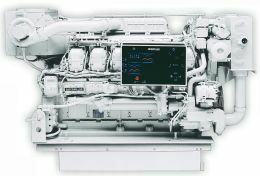 As well as engines, Caterpillar also produces compact electrical generators known for their size and reliability, the latter due to the use of tried and tested but evolved thermal units. There is no doubt that this company's important design and production know-how for engines and work instruments is the reason why boatyards and owners worldwide rely upon its quality engines. Caterpillar marine propulsion systems efficiently meet exhaust fume limits set by IMO regulations and in addition are produced in factories with ISO9001 certification. All this plus the presence of over 1,800 dealers and assistance centres all over the world. For further information please visit the website www.caterpillar.com, where your nearest importer can easily be traced.